Does your foot speek to you sometimes asking you for its independence maybe ? Had not thought of the possibility of the black symbol as a dog... "black dog runs at night." Since the cow is over the moon and the dog is under the moon, we can only assume the little dog is laughing to see such sport. The dish and spoon have, of course, run away to the dinner table for some lively conversation. Or maybe the moon is actually a left-arm, ring-finger fingernail? Each symbol above represents the nature of each Cooper. A good Coop and a bad Coop. That's a pretty good one. 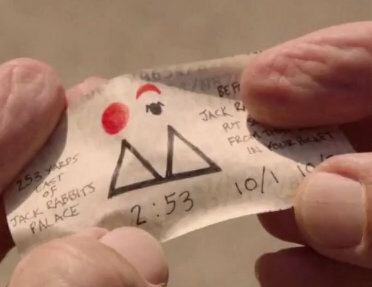 The obvious misdirection being, most people would interpret the triangles as the Twin Peaks. Of course, it may not be misdirection at all but them's the breaks.